This transitional ceramic top set belongs to the exquisite Roxy design series. It features a rectangle shape. This ceramic top set is designed to be installed as a drop in ceramic top set. It is constructed with ceramic. This ceramic top set comes with a enamel glaze finish in White colour. It is designed for a 8-in. o.c. faucet. 1.5-in. thick profile rectangular white ceramic top. This model is designed with integrated hot-cold supply lines for standard US plumbing connections. Ceramic top features an overflow. Faucet is constructed with lead-free brass ensuring durability. Faucet features a high-quality ceramic cartridge. Only faucet is CUPC approved. Installation instructions and hardware included in the box. All hot-cold waterlines are included. Luxury bulky solid brass look and feel. Quality control approved in Canada and re-inspected prior to shipping your order. Can be installed as a counter top on a cabinet. Premium white glaze for a glossy finish with a kiln dried ceramic construction. Two handles for ease of operation and smooth temperature control. A thick profile ceramic top that effortlessly complements our inaugural Emily collection of vanities. It features kiln-dried ceramic construction, and double-fired to maximize longevity. It measures 21.5 in. wide, 18 in. deep, and 7 in. vertically, and comes predrilled to accommodate single hole faucets. Comes coated in a premium, stain-resistant white glaze. American Imaginations 24- inch W 1 Hole Ceramic Top Set In White colour - CUPC Faucet Incl. It features a rectangle shape. This ceramic top set is designed to be installed as a drop in ceramic top set. It is constructed with ceramic. This ceramic top set comes with a enamel glaze finish in White colour. This transitional ceramic top set product is CSA certified. It is designed for a 1 hole faucet. Home Styles Create-a-cart in a white finish with a stainless steel top features solid wood construction, and 4-Utility drawers; 2 cabinet doors open to storage w/adjustable shelf inside; Handy spice rack with Towel bar; Paper Towel holder; Heavy duty locking rubber casters for easy mobility & safety. Size: 48w 17.75d 35.5h. The MD Building Products 1 inch. x 84 inch. Vinyl-Clad Replacement Weatherstrip is designed to replace most styles of weather-stripping that are factory installed. This compression strip installs in a slot in the door jamb conforming to irregularities and forming a weather-tight seal. Protect your home from the elements in all seasons. 24-inch W x 18-inch D Ceramic Top Set with 8-inch O.C. 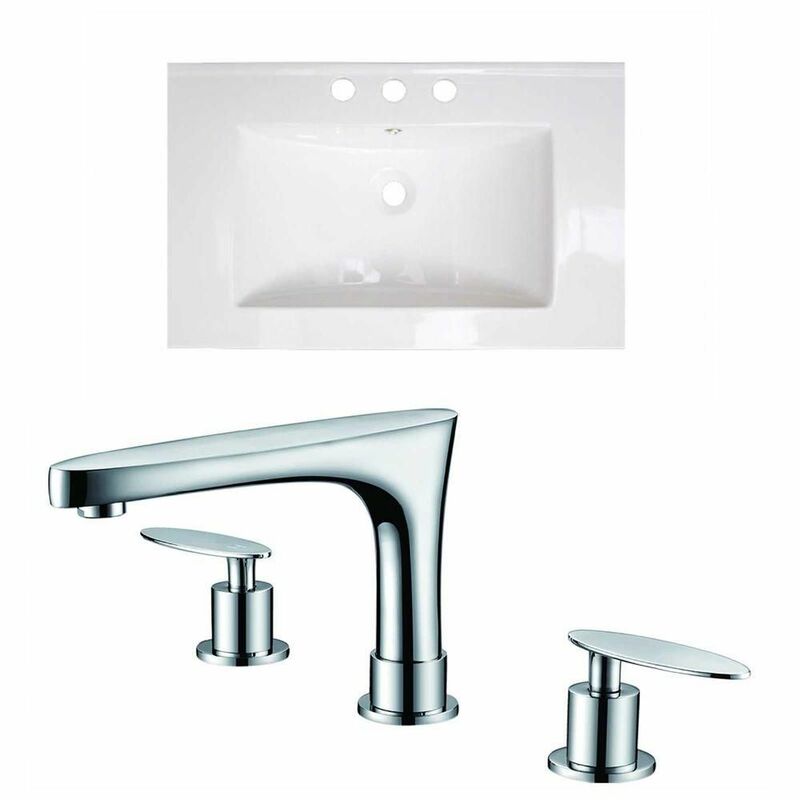 Faucet in White This transitional ceramic top set belongs to the exquisite Roxy design series. It features a rectangle shape. This ceramic top set is designed to be installed as a drop in ceramic top set. It is constructed with ceramic. This ceramic top set comes with a enamel glaze finish in White colour. It is designed for a 8-in. o.c. faucet.